Patients hospitalized with heart attacks, heart failure, atrial fibrillation or stroke in Northern Ontario, Canada, were more likely to be readmitted to the hospital and repeatedly hospitalized after discharge than those living in Southern Ontario. Yet, no geographical differences were found in 30-day survival rates. A new study published in the Canadian Journal of Cardiology recommends providing access to timely transitional care by clinicians who have the knowledge and expertise to treat patients recently discharged from hospital as one of several strategies necessary to reduce hospital readmission rates. “Hospital readmissions are costly to the healthcare system, but they are also potentially avoidable. Reducing readmission may lead to lower costs of care, which we found tended to be higher in Northern Ontario at one-year follow-up. Our study highlights some of the differences in outcomes and the need for new strategies to try to reduce readmission rates for cardiac disease patients in the North,” said Douglas Lee, MD, PhD, the Cardiovascular Program Lead and Senior Scientist at the Institute for Clinical Evaluative Sciences and the Ted Rogers Centre for Heart Research. Dr. Lee is also associated with the Peter Munk Cardiac Centre of the University Health Network and is a Professor of Medicine at the University of Toronto, Ontario, Canada. The study compared death and readmission risks of patients admitted with acute myocardial infarction (AMI), heart failure (HF), stroke or atrial fibrillation (AF) in Northern compared to Southern Ontario. Northern Ontario regions tend to be more rural, have fewer doctors, and less access to specialist care and important diagnostic tests. However, even when urban or rural region of residence was considered, patients with these four conditions were more likely to be re-hospitalized in the North, despite accounting for several factors including bed availability and length of hospital stay. 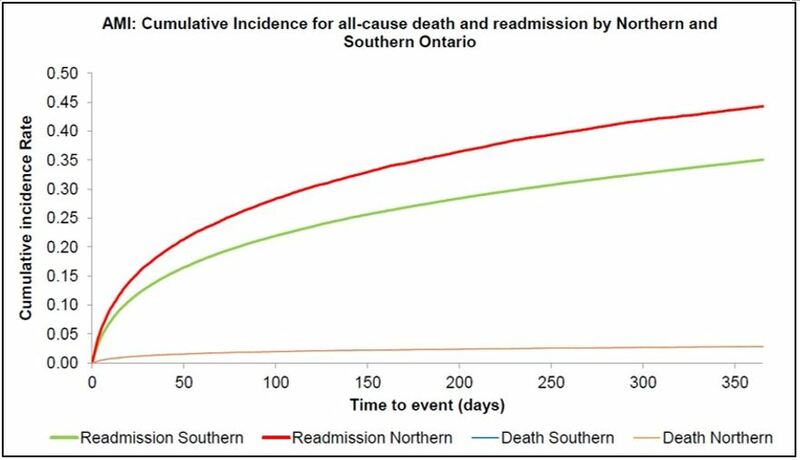 Acute myocardial infarction (AMI): cumulative incidence for all-cause death and readmission by Northern and Southern Ontario. “Our study supports the finding that geographic factors may be of greater importance for readmission outcomes than rurality, because all cardiovascular conditions exhibited higher readmission rates in both rural and urban regions in the North,” noted Dr. Lee, who hopes that the different regions can learn from each other through greater exchange of ideas and strategies. The authors suggest that among the multiple potential reasons for high readmission rates in Northern Ontario, reduced access to post-discharge care is one plausible explanation. “Cardiovascular medicine is becoming increasingly complex, and it will require the combined efforts of specialists and primary care physicians to result in the best outcomes and quality of care for our patients,” commented Dr. Lee. He suggests that programs such as the Ontario Telemedicine Network, mobile health services, and travel grants may lead to improved health accessibility in Northern regions. The article is “Comparison of Readmission and Death Among Cardiac Patients in Northern vs. Southern Ontario,” by Patrick Donio, HBSc, BA; Cassandra Freitas, MSc; Peter C. Austin, PhD; Heather J. Ross, MD, MHSc; Husam Abdel-Qadir, MD, PhD; Harindra C. Wijeysundera, MD, PhD; Karen Tu, MD, MSc; Peter Cram, MD, MBA; Peter Liu, MD; Howard Abrams, MD; Jacob Udell, MD, MPH; Susanna Mak, MD, PhD; Michael Farkouh, MD, MSc; Jack V. Tu, MD, PhD; Xuesong Wang, MSc; Sheldon Tobe, MD; and Douglas Lee, MD, PhD (https://doi.org/10.1016/j.cjca.2019.01.004). It will appear in the Canadian Journal of Cardiology, volume 35, issue 3 (March 2019) published by Elsevier. This study was funded by a grant from a Strategy for Patient-Oriented Research (SPOR) grant from the Ontario SPOR Support Unit (OSSU) and a Foundation grant from the Canadian Institutes of Health Research. Dr. Lee is supported by a mid-career investigator grant from the Heart and Stroke Foundation and the Ted Rogers Chair in Heart Function Outcomes. Full text of the article is available to credentialed journalists upon request. Contact Eileen Leahy at +1 732 238 3628or cjcmedia@elsevier.com to obtain copies. Journalists wishing to speak to the authors should contact Melissa DiCostanzo, Senior Public Affairs Advisor, Peter Munk Cardiac Centre, University Health Network, at +1 416 340 4429, +1 647 669 8416 (mobile), Melissa.DiCostanzo@uhn.ca, or Deborah Creatura, Media Advisor, Communications, Knowledge Translation, and Exchange, ICES Central, at +1 416 480 4780, +1 647 406 5996 (mobile), deborah.creatura@ices.on.ca.